Jerusalem, 20/03/2018 – The Neurosurgery team at Makassed Islamic Charitable Hospital, led by Dr. Asaad Darawish, succeeded in performing a qualitative surgical procedure on a 3-month-old baby suffering from crushed brain tissue or herniation, as well as a subcutaneous excess build-up of cerebrospinal fluid or cerebral edema. 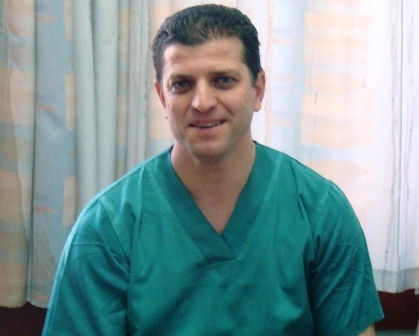 Dr. Darawish, a neurosurgeon, stated that the damage to the baby’s cerebral membranes occurred during childbirth at another hospital due to the use of a Ventouse, or vacuum extraction, noting that the ultrasound screening performed during the mother’s pregnancy showed no signs of congenital malformations to the fetus’ head. The baby was afterwards transferred to Makassed Hospital for treatment. Dr. Darawish noted that such an eventuality is infrequent in Palestinian or regional hospitals, but may have resulted from rare complications occurring after childbirth. Dr. Darawish pointed out that the surgical intervention had been carried out with utmost precision and success and that the procedure had succeeded in saving the baby, whose life was in real danger, especially with the excess build-up of cerebral fluid in his head. After having performed a CT head scan on the baby, his surgery was carried out in two stages: The first stage entailed the emptying of the cerebrospinal fluid collected under the cerebral membranes through the placement of a temporary external tube; and then in the second stage the liquid drainage tube was removed and the cerebral membranes were repaired, without the need to insert a cerebral shunt in order to drain the cerebrospinal fluid. In turn, the infant’s mother explained that her baby began to suffer from several symptoms immediately after birth, showing signs resembling convulsions two days after his birth, while his head swell and increased in size. She went on to thank and praise Dr. Darawish’s efforts in saving her baby’s life after correctly diagnosing his condition, and the doctor’s continued postoperative care and follow-up of his case and situation, adding that he is now in stable condition following the success of the operation.